season with Grace for President, The Musical Oct. 5-6 at the Chapman Cultural Center. hilarity in the wonderful world of politics. 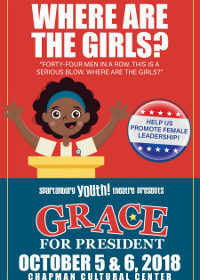 “Grace for President tells the delightful story of one brave girl’s unique journey to leadership. count,” Connor Vetter, Director of Grace for President.